Chaidh cur às de làrach-lìn Ross County le mearachd, is tha trioblaid aca a-nis a thaobh a bhith a reic thiceadan. Bha sgioba Inbhir Pheotharain, a bhuannaich Cuach an Lìog air an t-seusan seo, a' cleachdadh na companaidh 123-reg. Thuirt a' chompanaidh, a tha a' coimhead às dèidh 1.7m làraichean-lìn am Breatainn gun chur iad às dhan fhiosrachadh a bh' air feadhainn dhe na siostaman aca le mearachd. 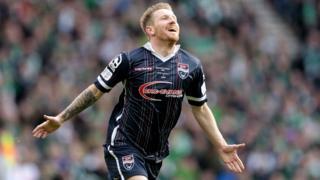 Thuirt Dàibhidh O'Connor bho Ross County gun chaill iad an làrach Disathairne agus gu bheil oidhirpean a' dol gus fhaighinn air ais. Cluichidh County Celtic an Glaschu Là na Sàbaid agus thuirt e: "Tha an làrach garbh cudthromach dhuinn nuair a thig e gu bhith a' reic thiceadan, agus 's ann an sin a tha an luchd-leantainn a' dol airson àite fhaighinn air busaichean agus airson faighinn a-mach mu gheamannan." Thuirt e gum faod daoine fònadh chun chluba air - 01349 860860 - no tadhal air an stadium aca airson ticeadan fhaighinn. Thuirt 123-reg gun thòisich iad "pròiseas sàbhalaidh" na bu tràithe an t-seachdain-sa.